Yosemite National Park is so popular because it packs so many beautiful places into a small area. What nature gives, people take away. A successful visit requires careful planning. Arrive early – by 8 am. Walk the Bridalveil Falls trail. Park at the main visitor center parking if shuttles are running. Leave your car there. 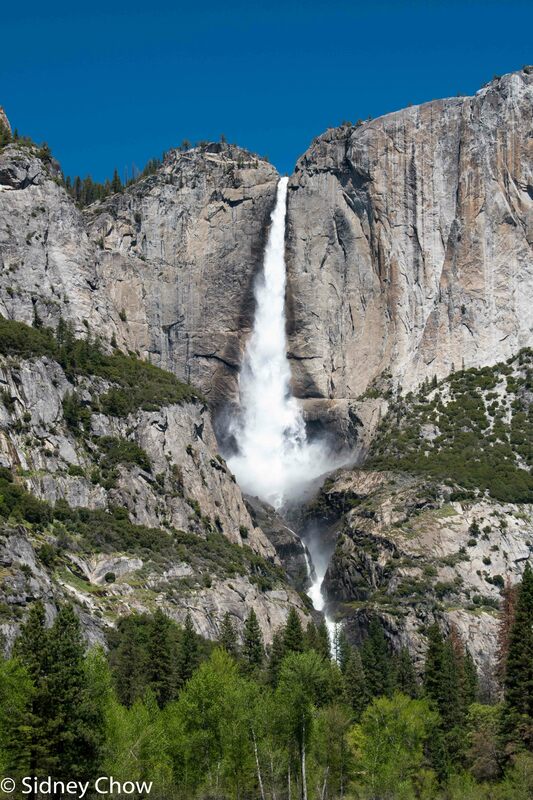 Walk the Lower Yosemite Falls trail. Walk the Cook’s Meadow Loop. Take the shuttle to Happy Isles and hike the Mist trail at least to the footbridge. Hike all the way to Vernal Falls, if able, via the Mist trail. Bring a raincoat. Return via the John Muir trail. Take the shuttle to Glacier Point, if open. Return to the car and drive to Tunnel View for an excellent view of the valley, made better by afternoon sun. 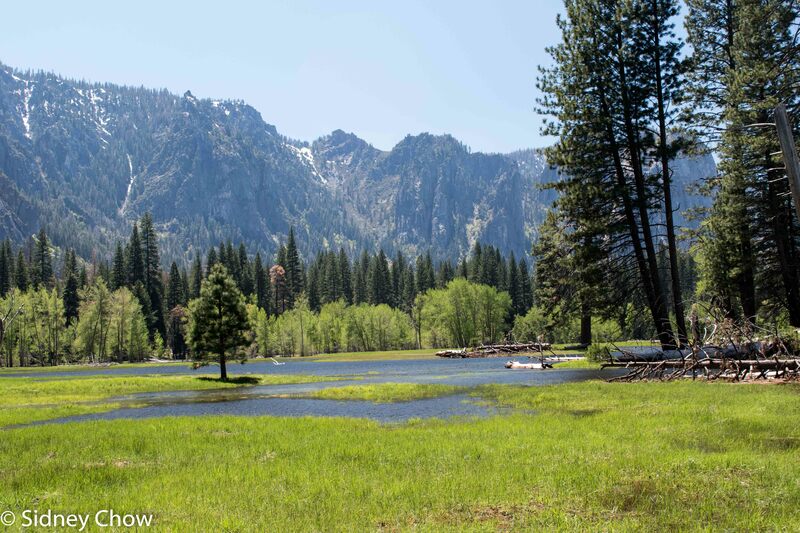 Cooks’ Meadow Loop – Enjoy the view all around you. Visitor Center – view the movie. Vernal Falls – Hike all the way to Vernal Falls, if able, via Mist trail. Return via John Muir trail. 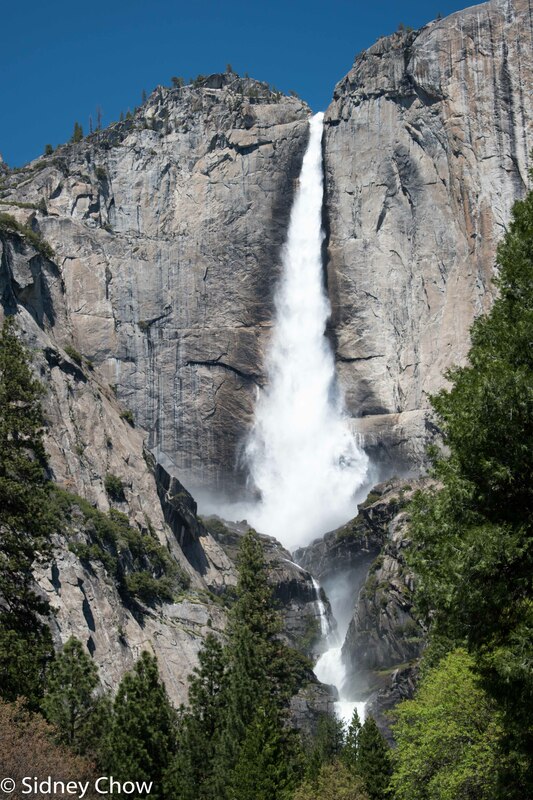 Nevada Falls – If able, hike from Vernon Falls to enjoy an even better view. Return via John Muir trail. Mirror Lake – Hike to Mirror Lake. Use the paved path on the left side of the river. 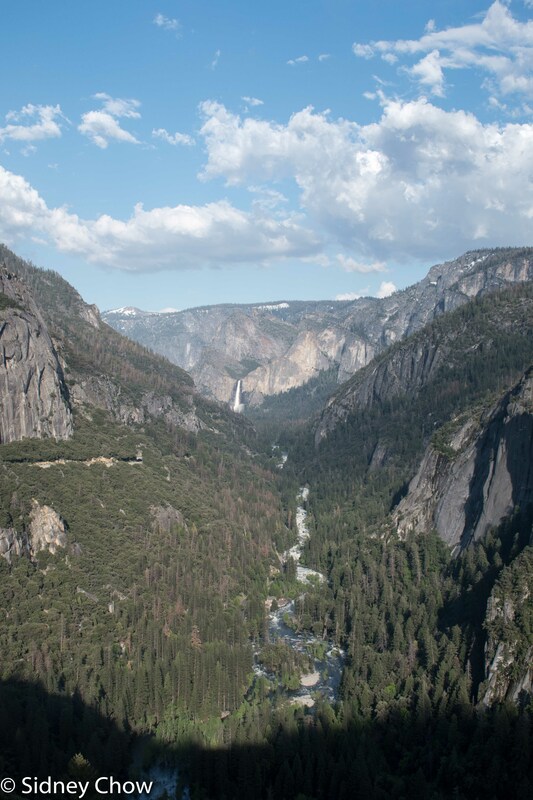 Tunnel View – Enjoy the fantastic view of the valley. The grey granite cliffs that frame Yosemite Valley with the signature El Capitan and Half Dome is one of the most photographed places because it so beautifully captures the imagination. Ansel Adams saw the beauty and captured it as best as anyone can, but still did not do it justice. When water is flowing, the thundering falls display the power and the beauty of nature like no other. The beast side of Yosemite is the crowd. More than five million people visited in 2016, and most stayed only in Yosemite Valley. The sheer volume of people concentrated in the small Yosemite Valley destroyed the ambiance of the national park. Most visitors never stray far from the road or the parking lot, which made those areas heavily congested and theme park like. The popular trails like the Mist trail felt like a rapidly moving line for a theme park attraction. The beauty was stunning but you had to wait for others to pass. The crowd subsided only with the longer, more strenuous trails in the back country. 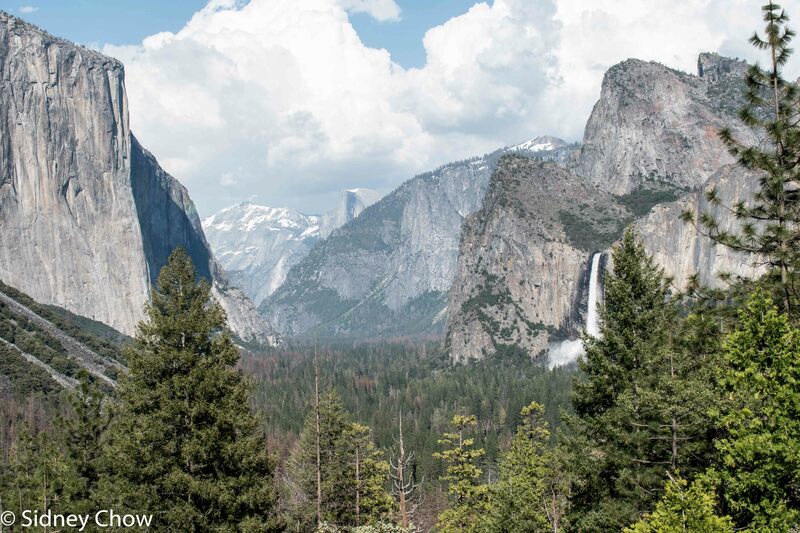 When is the best time to visit Yosemite? The spring. During our visit in early May, 2017, the Sierras was coming off a winter with one and half times the normal snowfall. The snow was melting and the water falls were the most spectacular in recent memory. We planned this trip for early spring to see the thundering water falls, since our last trip was in the fall and the water falls were dry because of the historic drought. We wanted to visit early enough in the season to minimize the crowds. Some roads were still closed from winter, which meant we cannot visit some areas. If we waited until later in the season, when all parts of the park were open, the crowds would be unbearable. Those were the trade-offs. Since we visited Glacier Point during our prior trip, we were not as disappointed it was closed during our visit. We were pleasantly surprised Hetch Hetchy road was open, and the Tioga Road was open all the way to Tuolumne Meadows. We were able to visit more areas than I thought. The first sign of trouble was at the south entrance station. Three lanes of cars, backed up 10 cars each lane, greeted us. 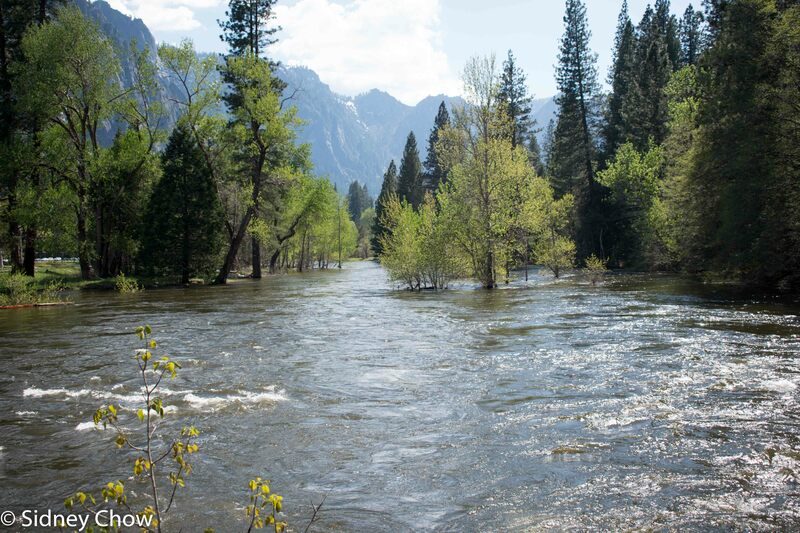 I was not expecting this for early May, and wondered what the crowd was like in Yosemite Valley. We had Just Ahead to give us excellent information about Yosemite as we drove towards Yosemite Valley. Just Ahead is a must have for auto touring in the national park. I knew there was a “wow” scene just on the other side of the tunnel as we approached the valley. When we emerged from the tunnel, the “wow” was the traffic, which was backed up as cars tried to get in and out of the parking lot. A couple of buses were parked with throngs of people milling about. All parking spots were full. Some waited for a spot to open, blocking traffic. I don’t like crowds so we decided to pass and come back later, not that we had much of a choice with the parking lot full. 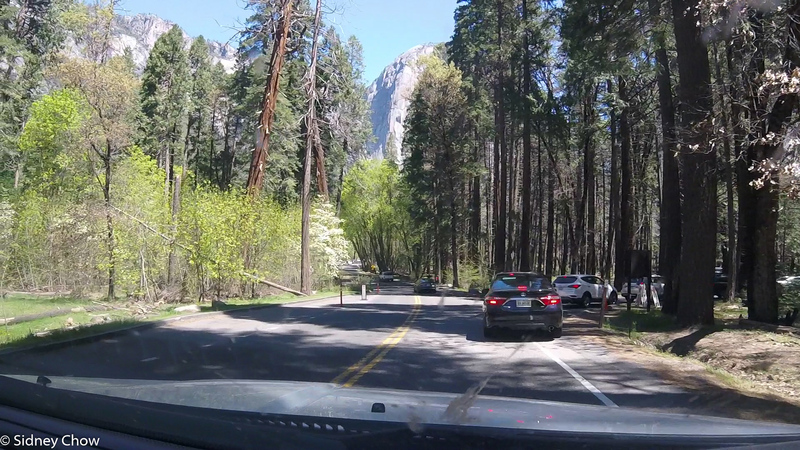 The parking area to Bridalveil Falls was also backed up, with a line of cars stretched onto the main road. 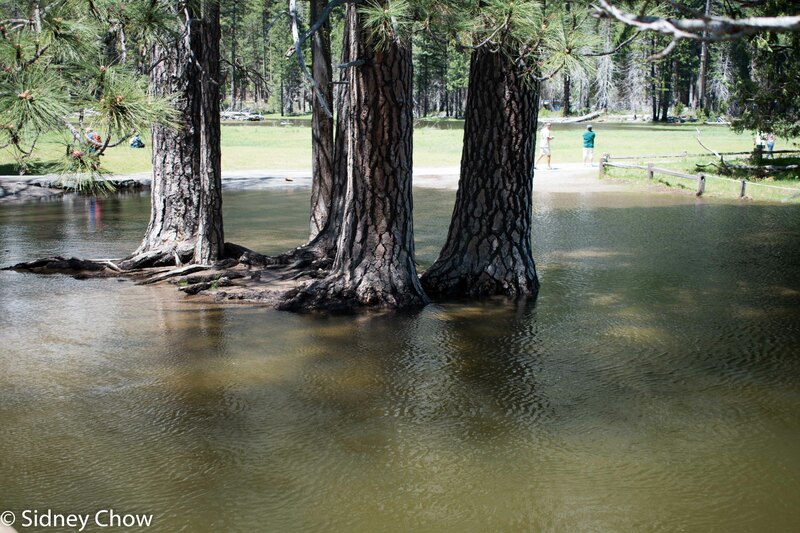 I knew Yosemite was going to have a lot more people than the other parks, but I didn’t expect this on May 3. I can’t imagine what it would be like during the peak summer season. When it got crowded, people behave rudely. Parking spots became a premium and people will park illegally. These were the problems I wanted to leave behind as I left the city, but the “theme park” crowd brought the city mentality to Yosemite. Despite the throngs of cars and people, Yosemite Valley is a beautiful place. The scene is post card perfect. Well, it has to be because many post cards and famous photos (like Ansel Adams) were taken here because of its beauty. Deep blue sky with an occasional puffy white cloud above grey granite rocks, with a reddish hue, formed the perfect view. White ribbons of water punctuated the granite cliff and roared on its way down to the valley. The sound of the waterfall is deafening as the mist flew up. The wind carried the mist and gave anyone downwind a misty shower. The flow of water is very large on this spring day. Yosemite Fall was visible from most areas of the valley floor. It’s white ribbon of water glistened in the afternoon sun. 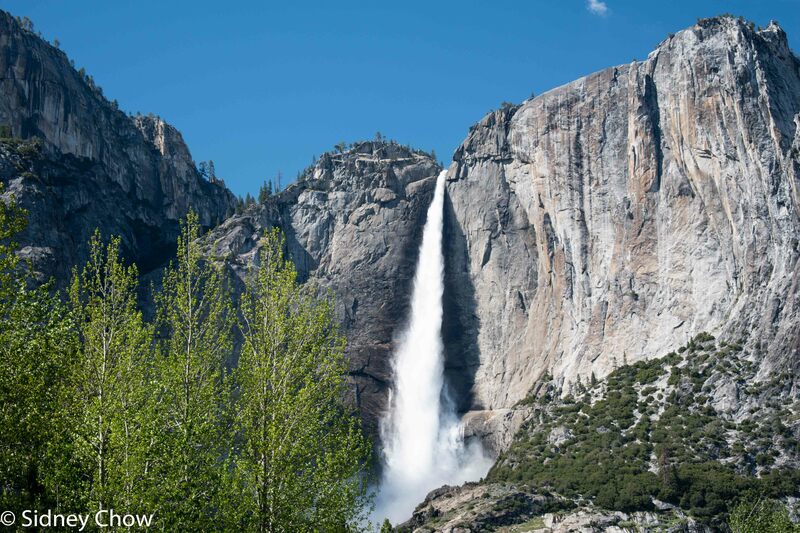 This was in stark contrast to our prior visit, when Yosemite Falls was dry. The strong water flow this spring made all the difference! Without the water falls, Yosemite was a beautiful place. With the water falls, Yosemite was a stunning place. We were lucky to find a parking spot at the Swinging Bridge picnic area by the Merced River. The river flowed rapidly and formed a beautiful foreground to Half Dome on the right, El Capitan on the left, and the white ribbon of Yosemite Falls straight ahead. This is the view that drew the crowds. We ate our normal Subway sandwiches as turkey vultures begged for food. Amazingly, when no one gave them food, they started to dance and extend their wings to draw people’s attention! Unfortunately, they got their wish when a family with young kids threw bread at them, re-enforcing the unnatural behavior. We decided to leave our car and walk to the visitor center across the river. The water level was so high, we had to walk across 4 inches of cold, icy water that flooded the trail. I felt the cold temperature of the water as I walked through the flooded path, not quite sure if my socks got wet. Thankfully, my waterproof hiking boots did its job and kept me dry. Loretta’s hiking boots were not water proof because she didn’t want to pay the extra $10 so she had to take off her boots and socks. As she walked through the water, she was yelling about her frozen feet as she barely made it across. She now thinks the $10 would have been well spent. We did our business (park stamp, talk to the ranger, watch the movie) at the visitor center. The volunteer ranger encouraged us to visit Mirror Lake with its flat trail. The easy walk to lower Yosemite Fall was like a theme park walk near the roaring rapids ride. The thundering waterfall and mist visible from the trail was only the lower fall, which was a fraction of the upper fall. Even the small portion of the falls had tremendous energy as the water smashed into the rocks blow. 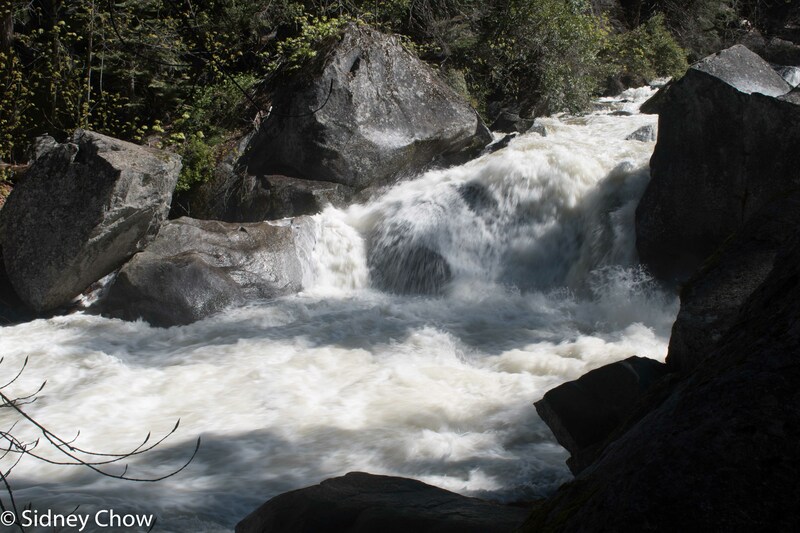 The sound was loud, the mist cold and refreshing, and the river raged as it made its way to join the Merced river. The scene was spectacular and the walk was short. This drew lots of people, both the “national park” people with backpacks, hiking boots, wide brim hats, and walking sticks, and the “theme park” people with flip-flops, sandals, dresses, and an occasional umbrella for sun protection. I don’t get how people can wear flip-flops and go on any trail in a national park. On the way out of the park, we stopped at the Tunnel View overlook and it was spectacular. The view to the end of the valley with Half Dome at the end, El Capitan on the left and Bridalveil Falls on the right perfectly framed the view. Once again, there were two buses, parking lot full of cars, and masses of people milling about, snapping pictures. We were lucky to find a parking spot at the upper parking lot, where the buses weren’t, for a slightly more tranquil experience. We had an excellent half day to get oriented. Many more sights and hikes in the next two days!